Dog lumps are a cause of big concern for many a dog owner; the primary one being is this cancer, and what should you do about it. In this article you will learn about the common lumps and bumps in dogs, particularly how to tell if they are serious or not. The causes of them will be explained, and most importantly you will learn what you can do for most of the lumps and bumps with at home remedies. Most lumps are easy to feel. They may show up on the chest or along the back. Most lumps on dogs are benign, while a small number of lumps that appear on dogs are cancerous. The most common ones on dogs are lipomas (benign fatty tumors), wart like growths ( papillomas), and sebaceous cysts. Here are the indicators of deciding whether or not a growth is serious: firm, not moveable, fast growing, and whether it opens and bleeds. These are more serious signs of cancer, and warrant a veterinary visit. Benign growths such as lipomas on the other hand are typically soft, moveable, slow growing, and never rupture through the surface of the skin. As your pet ages, its immune system becomes less effective and lumps and bumps become more prevalent. Lipomas are bengin fatty growths, often seen in middle aged overweight pets. Sebaceous glands are normal glands that provide the health fatty layer in the skin; a sebaceous cyst occurs when the gland gets plugged up and can no longer drain. The papillomas are often caused by an viral infection, producing the nodular wart like appearance. The more serious cancerous growths, such as skin mast cell tumors are secondary to uncontrolled cell growth; the causes are many, such as diet, environment and genetics. 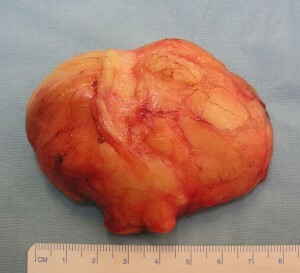 The first thing you want to do is examine the mass, and assess the severity of the lump. Lumps that are regularly shaped are less likely to be serious. Lumps that move easy under the skin are usually benign, such as fatty tumors (lipomas). Lumps that grow slowly are likely benign. Lumps that discharge a cheesy material are usually sebaceous cysts and can be left alone. A simple thing to do to determine if a mass is serious is to visit your veterinarian and have him or her perform a needle aspirate and cytology of the lump. A microscopic slide can often tell if it is serious or not. A ruptured cyst needs to be kept clean so it will heal and not become infected. Wash it twice daily with an antiseptic solution (such as chlorhexidine or iodine). Trim the hair around the cyst to aid in cleaning. You can also use holistic antiseptic solutions such as concentrated black tea, wiping the area three times daily. Healing compresses are especially helpful for cysts and papillomas. A cyst that is enlarged but won’t rupture can be decreased in size by applying a warm cloth directly to the area daily. Ensure that the cloth is hot to your skin ( but not too hot), then let it cool on your dog’s growth. Another option is to use a bean bag compress; heat the beans in a microwave, test it on your skin, and apply. Stimulate your dogs skin immune system with key nutrients: vitamin E and essential fatty acids are great for boosting your pet’s skin immune function: give 100 IU per 10 lbs of body weight daily of Vitamin E. For dogs use ground flax as the essential fatty acid source, giving 1 teaspoon per cup of dog food. There are 2 anti-inflammatory type herbs that I have found especially helpful for ruptured cysts and papillomas: Aloe and Calendula. These can be purchased in a cream form, or Aloe from a plant can be applied directly to the affected area. Some pet owners have found homeopathic remedies for be helpful for many growths. Thuja is. the first homeopathic remedy that many homeopaths advise for any type of canine growth. The dose is 30C given once-twice daily for at least 30 days. Causticum is used for warts that tend to bleed. Give 30C once-twice daily for at least 30 days. Dog lumps and bumps are most often benign growths, which can often be treated safely at home. In this article you learned how to tell if the growth is serious or not, and have an understanding of what causes these common lumps. The more effective solutions to treating these at home are shown, using topical compresses, herbs and homeopathy. Thank you for the article on lumps in dogs. I had two lumps aspirated when my dog was three yrs old. It was just fatty tissue. He is now 12 yrs old and has a few more lumps, but they feel the same and grown very slowly. I feel better now that I know what to look for. I am wondering why you advise flax seed powder for an omega 3 supplement. It is my understanding that dogs cannot convert the omega 3 from vegetable sources into the required DHA’s and EPA’s that are needed. Therefore it is useless to them. Fish oil, that is already in the form of EPA’s & DHA’s is the only thing that is effective. Am I wrong? Thank you for this article. My 3 year old Chinese Crested is going to have a lump on the tail removed surgically next week and I am extremely apprehensive until I hear the results. Previously his vet wasn’t that worried about it but now it has grown and he says it is time to get it off. I hope this is a benign type growth – don’t for sure how I could handle it otherwise as this little guy is my companion. Pick some comfrey leaves, but them in the blender and add a small amount of water to form a green paste. Apply this paste to the lump. Within 7-10 days it will completely disappear. This applies to growths like the one pictured at the top of the page. I have now seen this happen in two separate cases – the results are dramatic. Hi,Im worried about my 10 year old English bull terrier she is showing deterioration green discharge from her eyes ,Drinking large amounts of water ,Unexplained weight loss,All this has come in just a few days,I think it may be diabetic?She is impossible to take to the vet,The last time was for skin problems and she nearly died getting her on the table,The vet was scared of her and tied a rope around her nose ,Poor thing could not breath this was on for over 15 mins,I am reluctant to take her again,What can it do ,Im so worried now. To Ellie: green discharge will indicate bacterial infection and diabetes would be the first concern with the other symptoms. A new vet is an absolute must! I’ve used copaiba oil on fatty tumors and shrunk them to nothing. Also used on a mass on my kitty that was huge, scar tissue was suspect, that covered his back behind his shoulder blades and was roughly 7×15 cm and irregularly shaped. Completely gone with copaiba. Vet was amazed. Surgery was the protocol for it and the skin would also have been taken. There are good, bad and useless oils out there. Do diligent research when looking into their use. Will keep the comfrey in mind.